The Medal of St. Olav was founded by King Haakon VII on 17 March 1939. It is conferred as “a reward for services in advancing knowledge of Norway abroad and for strengthening the bonds between expatriate Norwegians and their descendants and their country of residence”. 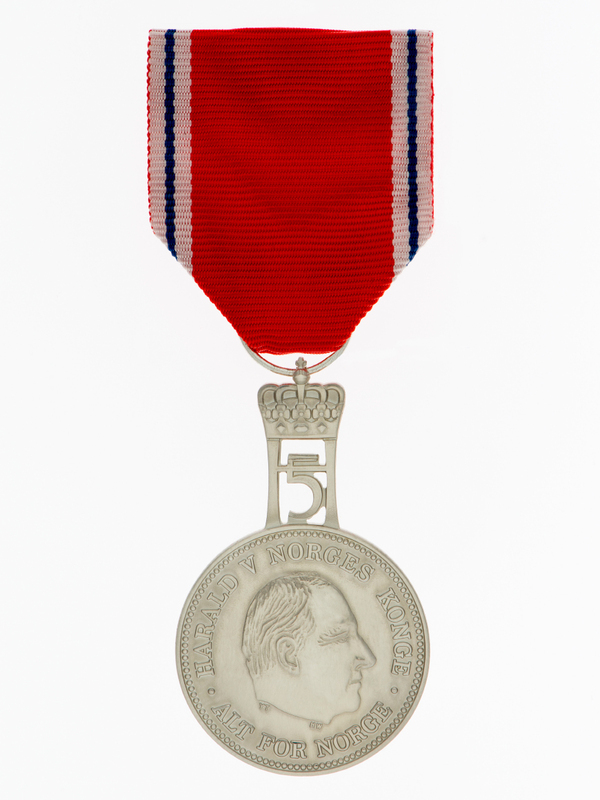 Both Norwegian and foreign nationals are eligible to receive the Medal of St. Olav. The medal is conferred in silver and bears a crown. On the obverse is the likeness of the head of the reigning Monarch in profile with his name and motto. On the reverse is the Cross of St. Olav. The monogram of the reigning King is placed over the medal. An oak leave cluster adorns medals bestowed for service during wartime. The medal is worn on the left breast suspended from the same ribbon as that of the Order of St. Olav. The Medal of St. Olav with an oak leaf cluster was previously bestowed by the King for service during wartime. In 2010 His Majesty King Harald V decided to make the Medal of St. Olav with an oak leaf cluster a decoration in its own right and place it at the disposal of the Norwegian Government in connection with a comprehensive new scheme of military service decorations. A Royal Decree of 10 December 2010 stipulates that the Medal of St. Olav with an oak leaf cluster may be bestowed for service during times of war and armed conflict in which Norway is or will be engaged. The Medal of St. Olav with an oak leaf cluster is bestowed by the King in the Council of State upon the recommendation of the Norwegian Ministry of Defence.